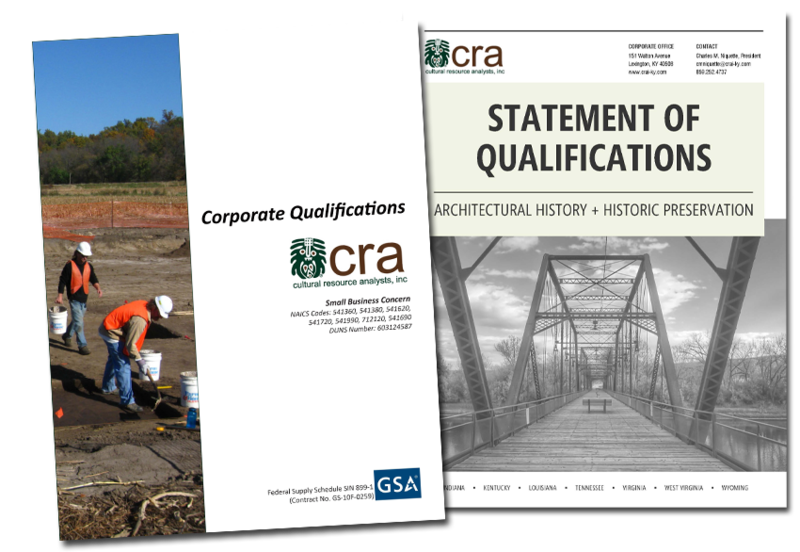 Statement of Qualifications | Cultural Resource Analysts, Inc.
Offering a national presence rooted in local expertise, CRA’s dedicated professionals have an intimate understanding of the complex nature of cultural resource management and historic preservation, whether in seeking to meet compliance requirements or actively preserving those historic places that make a community unique. As a small business with a core group of experts, we take pride in being highly responsive, providing excellent service, and developing long-term working relationships. Special care is always taken to ensure that we provide the most appropriate and strategic solutions to cultural resource-related needs, and we proudly carry our reputation of working alongside our clients to produce high-quality work tailored to meet the specific goals of a project. Our commitment to our clients is complemented by our understanding of best practices in historic preservation and cultural resource management and our strong reputation with local, state, and federal agencies. This reputation is rooted in our professionals, their expertise, and their commitment to their work, which are fundamental to our accomplishments. Recognizing the importance of timely and cost-effective approaches, CRA prioritizes proactively working with entities such as departments of transportation and State Historic Preservation Offices to develop innovative solutions that promote the success of a project. Our public and private sector clients across the country have consistently recognized CRA’s ability to craft documentation of the highest quality and routinely task us with their most challenging projects. View our SOQ to learn more about CRA, our capabilities, and how we can help you achieve your goals on your next project. Want additional information about our expertise or have a question? Let us know. QUALIFIED. Our staff consistently exceeds requirements for professional education and experience. 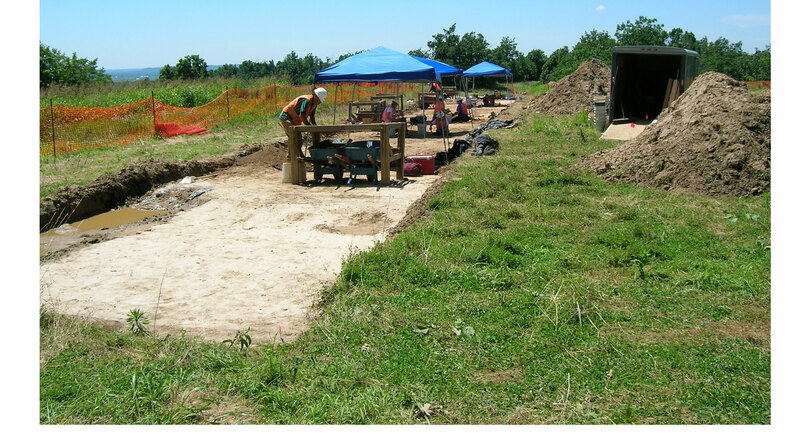 Every team member has a bachelor’s degree or higher, and all key personnel possess a master’s degree or higher; exceed the Secretary of the Interior’s Professional Qualifications for Archaeology, History, and/or Architectural History; and have at least a decade of experience. EFFICIENT. Our company structure promotes efficient project delivery from each of our seven offices, which are designed to be particularly responsive to the needs of regional clients across our service areas. This structure and our staff capacity allow us to conduct concurrent, large-scale and complex projects across the country. RELIABLE. Supported by a highly-qualified executive management team with decades of experience and a multi-disciplinary pool of professionals, CRA has the depth of staff, equipment, resources, and management processes necessary to guarantee effective completion of projects on schedule and budget. RESPONSIVE. We value the relationships we establish with our clients and recognize the importance of being available to them to discuss projects. Rooted in our extensive experience working as a prime or subcontractor with clients in both the private and public sectors, we also recognize the need for timely, cost-effective approaches that facilitate project goals. "I can say without hesitation that after 21 years of reviewing archaeological reports in Illinois this is by far one of the best and certainly the best cemetery report I have reviewed. The report is a very professional and informative study. Historic cemetery studies are quite rare in Illinois and I think this report will serve as a model for a long time." "The Division congratulates Ms. Bybee on the authorship of what may well be the finest archaeology technical report received by this office..."
"CRA performed a very thorough investigation of the building with exacting detail...As we are engaged routinely in writing technical reports, this Historic Preservation Plan was of the highest quality and greatly exceeded our expectations." 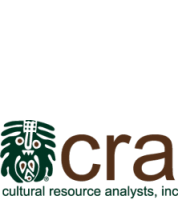 "CRA was an unbelievable asset to our team in approaching both the COE and SHPO...CRA steered the ship through the agencies and creation of the MOA. There is no way that we could've navigated through the agencies without your help." "Get CRA on the job and get a quality, no hassle product..."
"Over the years I worked with different contractors on many different types of jobs, but I never worked with a more professional one than CRA...Chuck and his firm always delivered no matter what physical or personnel obstacles were encountered during a job and always left the client completely satisfied with the work." "Thanks to all of the employees at CRA for the quality of work and level of effort that you put forward in helping getting the data recoveries done to allow construction of the Rockies Express Pipeline to continue without delay. It has been a real pleasure to work with everyone at your company..."
"The speed with which you put together this report is nothing short of amazing. I appreciate all your efforts and will not hesitate to call upon CRA whenever I am given a chance." "We have found CRA to be of the highest caliber in their field of expertise. KYTC routinely assigns them its most difficult tasks with the most demanding schedules and they consistently deliver results." "Your work for the Corps of Engineers has always been outstanding and has always allowed us to maintain our construction schedules while being in full compliance with historic preservation laws. Thank you for your contributions to public archeology..."
"..the report was thoughtful, thorough, well written and well researched. Such reports greatly accelerate the review process by providing needed information in a clear and timely manner."